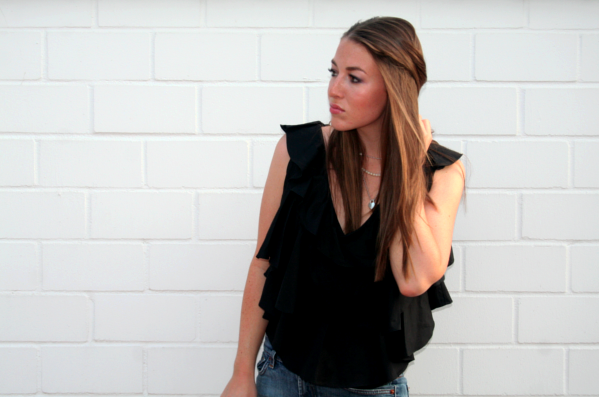 This ruffled top is definitely one of my summer favourites. It has some kind of extravaganza to it that makes all of my dull basics (old skinnies in this case) instantly look fashionable. Could use more of that…ha, ha. Going out on a summer night in black & blue shades. I remember when this used to be a hideous combination (and my mom still doesn’t like it!) but guess what: now I can’t get enough of it! One good thing about the post-SATC-era: There are no rules in fashion. Thanks, Carrie! See how beautiful the ruffle detail is? Top: Baum & Pferdegarten (sounds German, but it actually is a Scandinavian brand! ), jeans: old, pearl necklace: vintage, silver necklace: Tiffany, shoes: Costume National, small clutch: Bottega Veneta (my mom’s), nailpolish: Splendeur & Blue Satin (both Chanel). cooles oberteil, gefällt mir sehr gut! Glückwunsch zu eurem Blogliebe Carola!Stimme vollkommen mit dir über Olivia Palermo als Inspiration überein;)Weiter so! Love the ruffles! And your shoes.. They are so beautiful! absolutely L.O.V.E. your blog! am definitely following you on bloglovin now! can’t wait to see whats next!